In Q1 2018 alone, 171,700 workers were employed directly in the Accommodation and Food Services sector and the total gross annual wage paid to those workers was €3.98 billion. In Q1 2018, it is estimated that 3,058 workers were employed directly in the Accommodation and Food Services sector in County Laois. Total employment in the Accommodation and Food Services sector in County Laois increased by 998 between Q2 2011 and Q1 2018. Indirect employment as a result of the change in direct employment in the sector is estimated at 459. 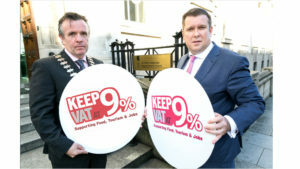 A recent report published by the Restaurant Association of Ireland (RAI) has revealed that 1,457 new jobs in the Accommodation and Food Services sector have been created in County Laois since the introduction of the reduced VAT rate of 9% in July 2011. This report identifies the direct and indirect employment associated with the introduction of the reduced VAT rate of 9%. Between Q2 2011 and Q1 2018, the number of people working in the Accommodation & Food Services sector nationally increased by 54,400, taking total employment from 117,300 to 171,700 on a seasonally adjusted basis. The sector also accounted for 7.7% of total employment in the economy in the first quarter of 2018. At a national level, the increase in indirect employment as a result of the job creation in the Accommodation & Food Services sector is estimated at 25,024. The increase in direct and indirect employment is estimated at 79,424. In Q1 2018, it is estimated that 3,058 workers were employed directly in the Accommodation and Food Services sector in County Laois. The total gross annual wage paid to those workers was€70.9 million. The total net annual wage paid to those workers was €62.9 million. The payroll taxes accruing to the Exchequer from this employment was €15.6 million. Indirect employment as a result of direct employment in the sector is estimated at 1,407. Total employment in the Accommodation and Food Services sector in County Laois increased by 998 between Q2 2011 and Q1 2018. The total gross annual wage paid to those extra workers is €23.1 million. The total net annual wage paid to those extra workers is €20.5 million. The payroll taxes accruing to the Exchequer from this extra employment is €5.1 million. Indirect employment as a result of the change in direct employment in the sector is estimated at 459. Due to this significant increase in employment in between Q2 2011 and Q1 2018, the total gross annual wage paid to those extra workers has amounted to €1,260 million. The total net annual wage paid to those extra workers is €1,118 million and the payroll taxes accruing to the Exchequer from this extra employment was €278 million.